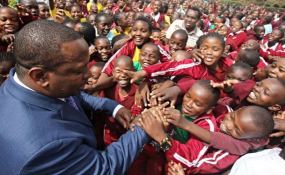 Nairobi Governor Mike Sonko with primary school pupils in Nairobi. Nairobi Governor Mike Sonko has hinted that he may not seek re-election in 2022 even as pressure continues mounting on him to appoint his deputy. Speaking during the Mashujaa Day celebrations in Nairobi at the weekend, Governor Sonko said his focus is on leaving behind a rich legacy by ensuring that he delivers his promises to Nairobi residents. He also vowed not to relent in his war on corruption in the county, even if it comes at the cost of losing key members of his cabinet. "I do not want to be re-elected as governor but I want to leave a legacy where I deliver to the poor and all Nairobi residents. We cannot deliver all these with petty politics," Sonko said. But even as the governor contemplates his next political move, pressure is mounting on him to finally appoint a replacement for his former deputy Polycarp Igathe, who resigned in January after failing to earn Sonko's trust. On Tuesday last week, President Uhuru Kenyatta told the Governor to get his act right in running the affairs of the county, pointing out his failure to construct proper drainage systems for the traders at the popular Gikomba market. And on Sunday, Nairobi Kikuyu Council of Elders demanded that Governor Sonko expedite the appointment of a new deputy governor from the four women he shortlisted in August. "He has been taking us in circus and we demand that he immediately appoints his deputy from among the four women he promised and desist from keeping Nairobians in suspense," said Samuel Mureithi, the council's Westlands sub-county chair. The four women Sonko shortlisted for the position are former Starehe Member of Parliament Bishop Margaret Wanjiru, corporate guru Agnes Kagure and lawyers Karen Nyamu and Jane Weru. Last week, a group of women held a peaceful demonstration on the streets of Nairobi demanding for the appointment of a woman as Nairobi County's deputy governor.